Hey there! Thanks for stopping by to learn how to make and install DIY cabinets. Over the past six months I've been busy renovating my fixer-upper home out in Montana. It has been a lot of work, but the reward of getting exactly what I want is going to be worth it. One thing I needed in the laundry room was a little organization around the washer and dryer, so here is one of the first projects! 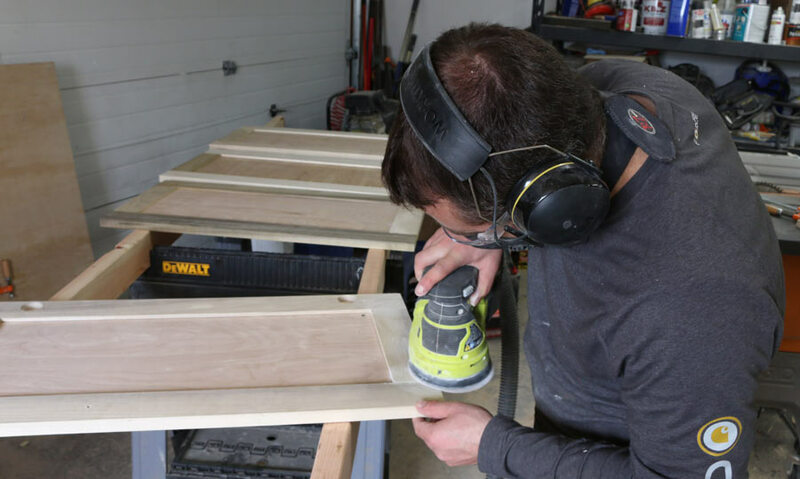 In this post, I'll be walking you through the process of making DIY cabinets to help organize your home. For me, these will be for my laundry room. 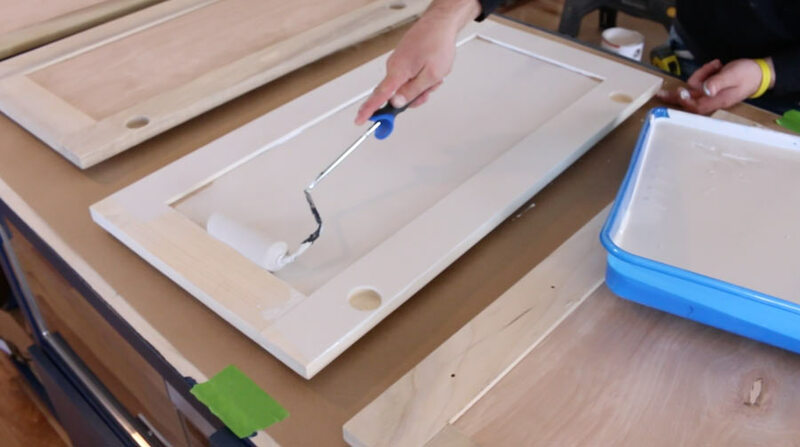 Cabinet uppers are a fairly simple DIY project that will provide plenty of storage for your detergent, softener, cleaners, rags, and much more. 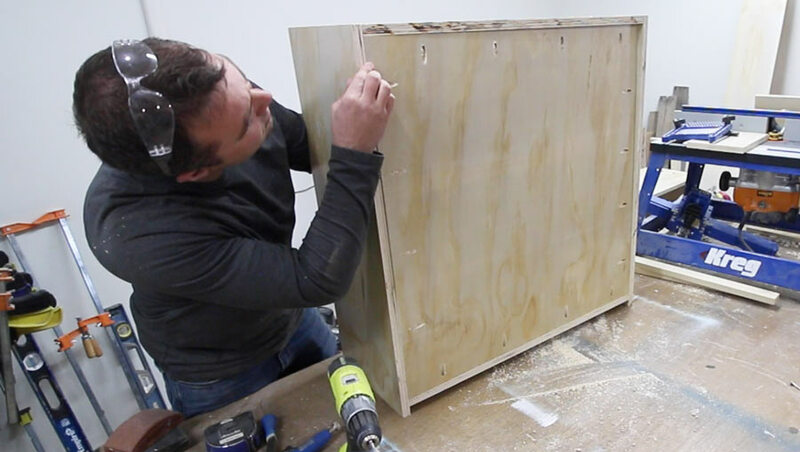 These DIY cabinets can be modified to any size and customized to fit your space. I’ve partnered with Maytag for the washer and dryer. I’ve been using their appliances for years without any problems and I absolutely love how quiet they are. 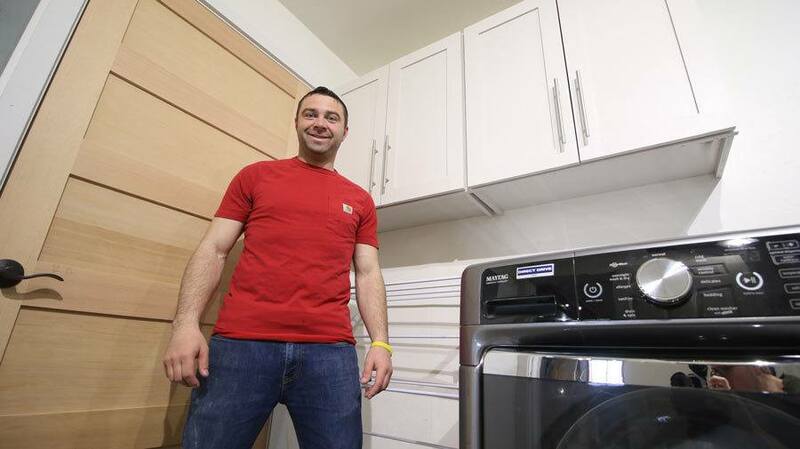 Not to mention, they clean clothes better than any washer and dryer we've ever owned. They are backed by a 10-year limited parts warranty, and are made to last! I've saved the best part for last... May is Maytag Month! The brand is offering powerful deals from May 3 - June 6 on kitchen and laundry appliances, so make sure to visit here for more details. 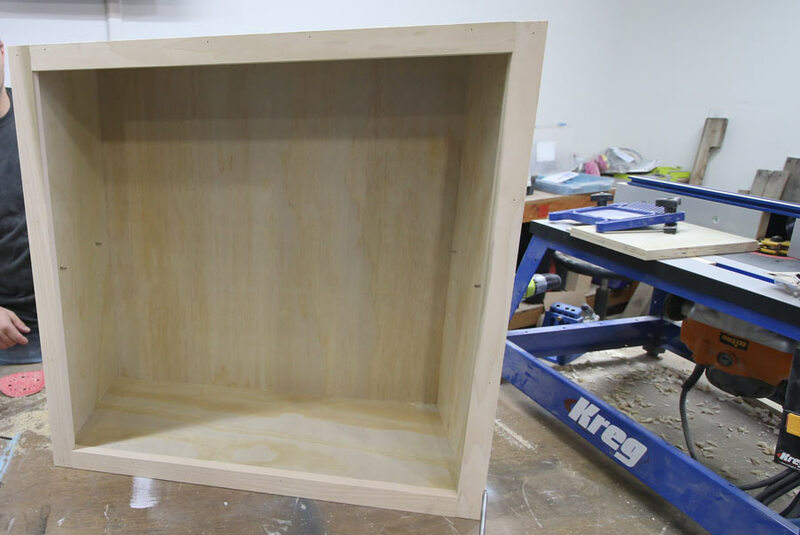 The DIY cabinet uppers we made are a pretty typical size for cabinet uppers. The width is 30 inches and the depth is 12 inches. You can download the FREE DIY Cabinet plans here (will be available May 15th). 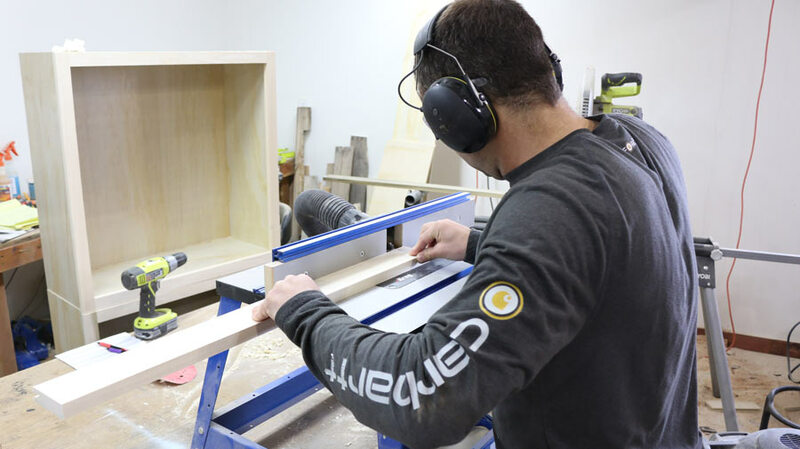 The beauty of building your own cabinets is you can customize them exactly how you'd like to best fit your space. 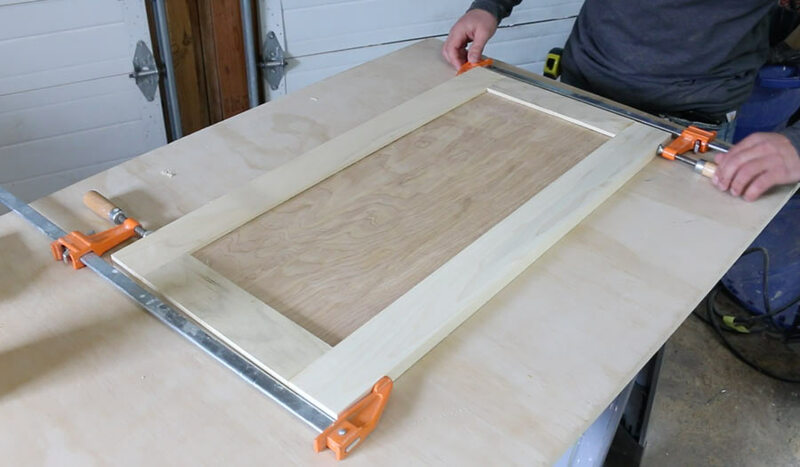 Start by cutting the plywood down to size to form the cabinet carcass. You'll make two side panels, a top, bottom, and back.. I would recommend using a table saw for this process. Once cut on the table saw, you can cut the ends down to size with a miter saw. The next step is to assemble the four sides of the cabinet. We'll do this using pocket holes for today's project. Drill four pocket holes on the ends of the top and bottom horizontal boards. 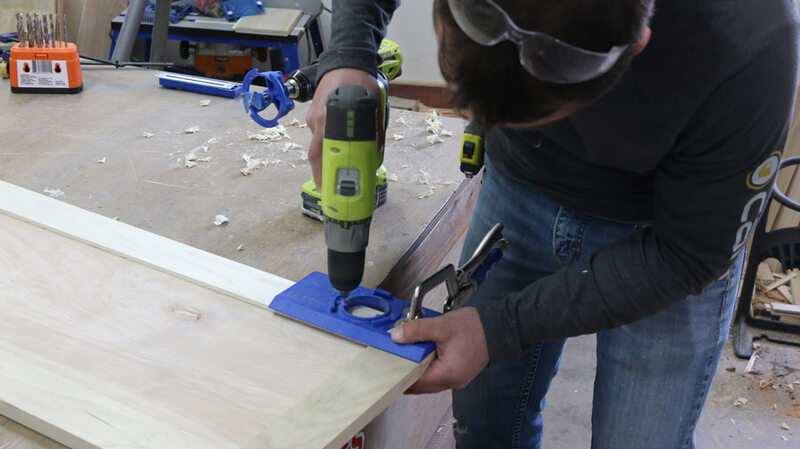 The blue tool in the photo is called a Kreg jig. Connect the boards to each other using 1 1/4 inch long pocket hole screws and wood glue. The horizontal boards are placed inside the two vertical boards. The top of the lower horizontal board needs to be placed 1 3/8" up to accommodate the face frame that will be attached in a later step. The face frame i will have about a 1/8 inch overlap on the lower horizontal board. The back is made out of 3/4 inch thick plywood and is placed inside the four outer boards. 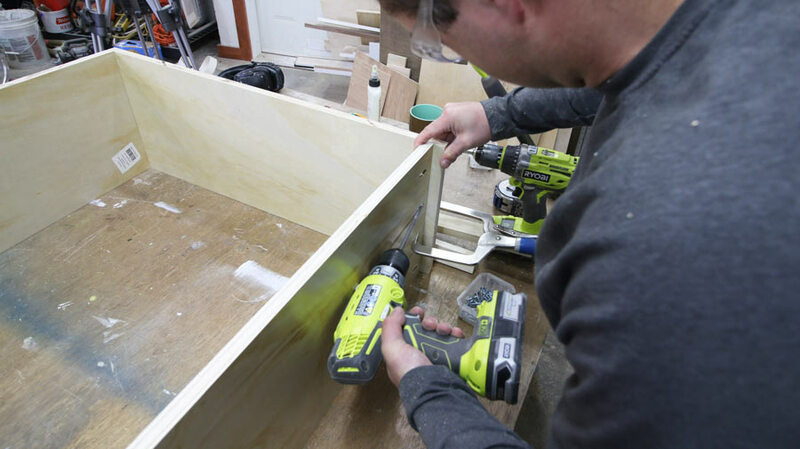 Pocket holes are drilled on the back side of the cabinet piece. Use 1 1/4 inch long pocket hole screws to connect the board. Tap with a rubber mallet to get it lined up perfectly. The face frame is made out of 1 1/2 inch by 3/4 inch thick wood. I used poplar board for the face frame and rails/styles on the cabinet doors. 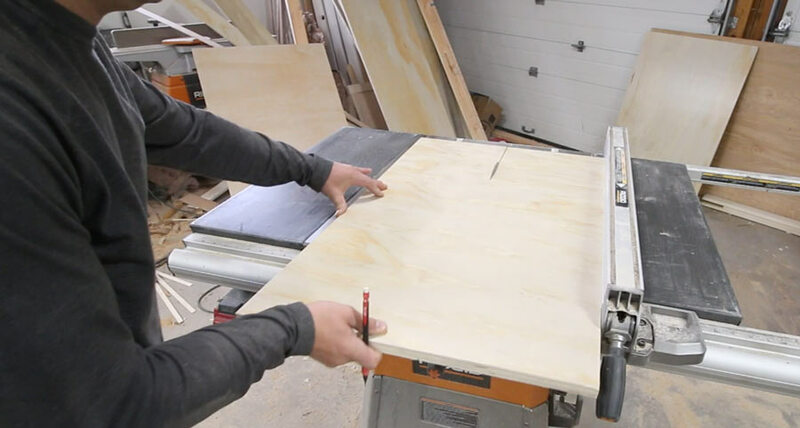 Cut the boards to length using a miter saw. 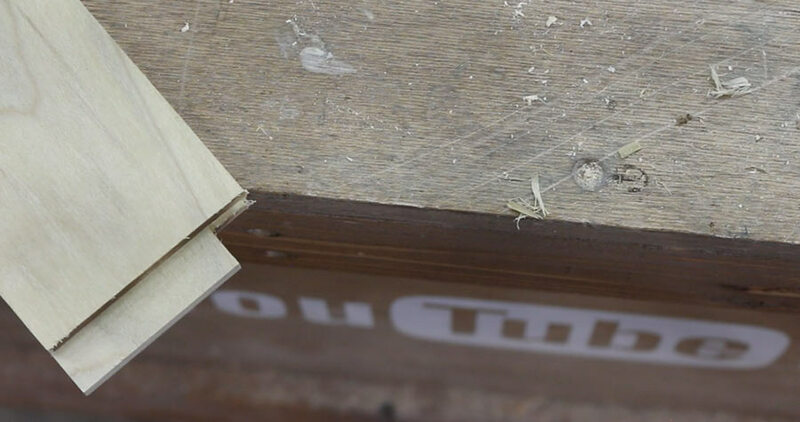 Then use a pocket hole jig to create two pocket holes on the ends of each horizontal board. Next, screw and glue the face frame together. 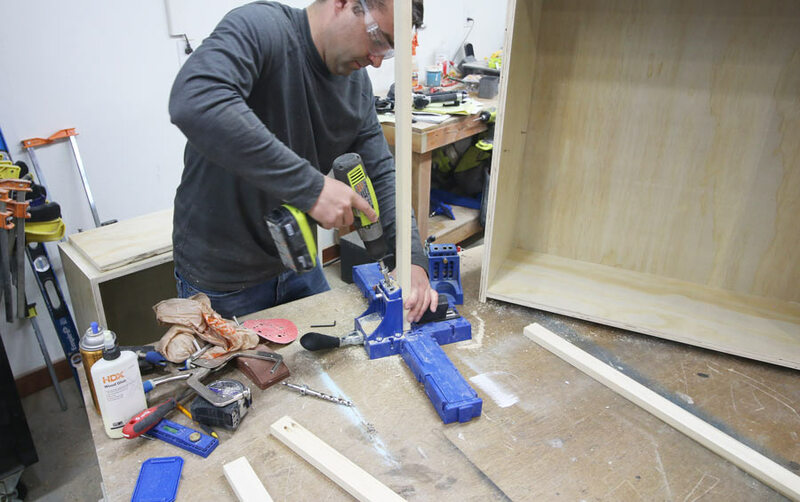 Once assembled, attach the face frame to the cabinet carcass. I used glue and 1 1/4 inch long 18 gauge nails in an air nailer. 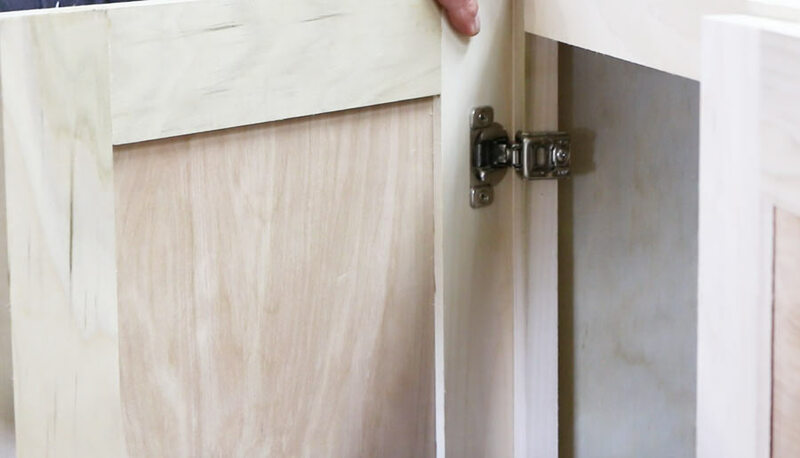 This is the easiest way to attach the face frame if you are planning on painting the cabinets. The nail holes can easily be filled with wood putty and then painted over. Here is a photo showing the face frame once attached to the carcass. The top of the face frame is flush with the top of the cabinet carcass. The sides overlap the inside and outside 1/4 of an inch. Use a jig to make the shelf support holes. I used an 8 inch long board as a spacer underneath the jig. Then insert shelf support pins. Cut a shelf out of plywood to fit inside the cabinet. It will be about an 1/8 of an inch less in width than the side panels. The cabinet doors are made out of poplar boards that are 3/4 inches thick by 2 1/2 inches wide. I used a 1/4 inch slot cutter to make a groove on the inside of the rails and stiles. The slot is what a 1/4 inch thick panel of plywood will sit in to make the door front. Cut a 1/4 inch tongue on the end of each short rail. Add glue in the slots and on the tongues. Clamp the two stiles ( vertical pieces ) to the rail. Next, slide the 1/4 inch plywood into the grooves. Add the final rail and apply clamps. Wipe up excess glue, and let the door cure. 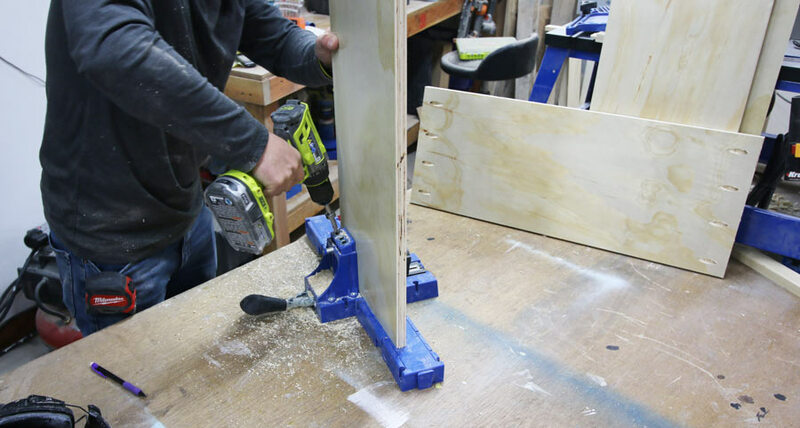 A jig makes it easy to create the hinge holes so everything will get lined up correctly. I set mine for 1 1/4" overlay hinges. Sand the doors and face frame prior to painting. The seams on my cabinets were not all perfectly flush, but sanding will flatten them out. I like to test fit the doors prior to painting. This only takes a few minutes and is well worth it just in case any size adjustments need to be made. Fill in pinholes with wood putty and tape inside the face frame prior to painting. Apply banding to the plywood shelves if you'd like a more finished look. Use a foam roller to apply your paint. I picked up some cabinet paint from the hardware store. It had enamel in it for durability and the rollers and brushes clean up with water. It took quite a few coats as the paint was somewhat thin. Use a brush to get the hard to reach areas. I used 1 1/4 inch overlay hinges to give the cabinets a more modern feel. The door pulls are 10 inch pipe handles. The jig I typically use to mount hardware wasn't big enough for the larger handles, so I made a custom jig to ensure the pulls lined up correctly with the screws. Here is a look at the finished cabinets before hanging them. Determine the height you'd like to hang our cabinets. I hung the cabinets at 54 inches from the ground which is pretty standard. 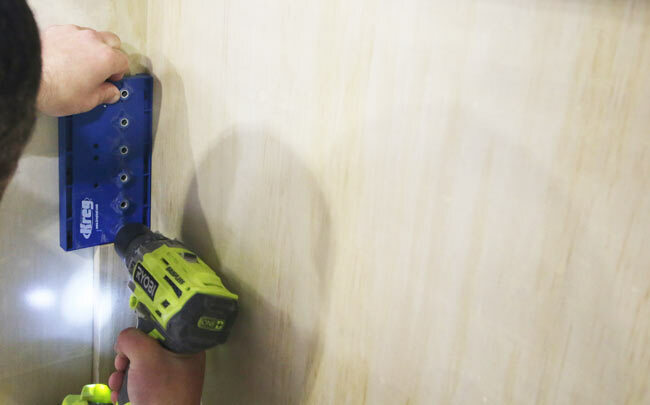 Attach a ledger board to the wall to help hold the cabinets while you are installing them. Find the studs in the wall and attach the cabinets to the studs in the wall with screws. 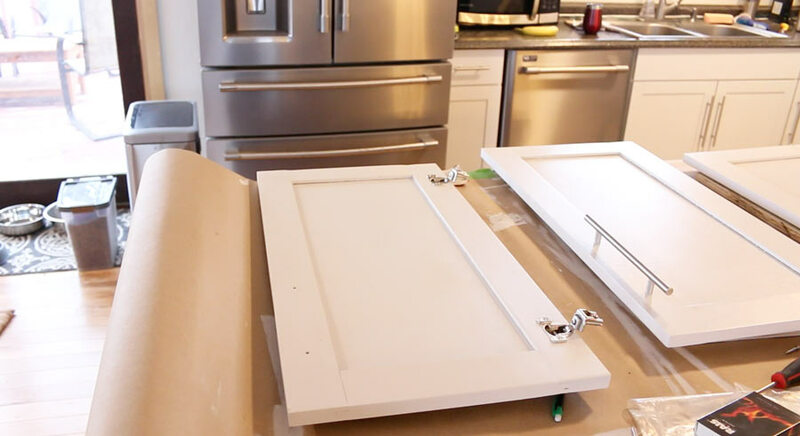 I hope this tutorial inspires you to build or install cabinets in your own home! 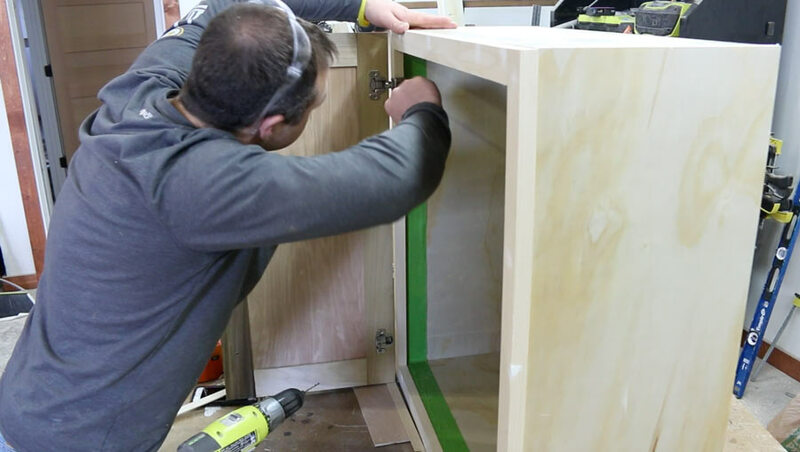 Learning to build cabinets is a process and it takes time, but the skills you'll learn will be well worth it. 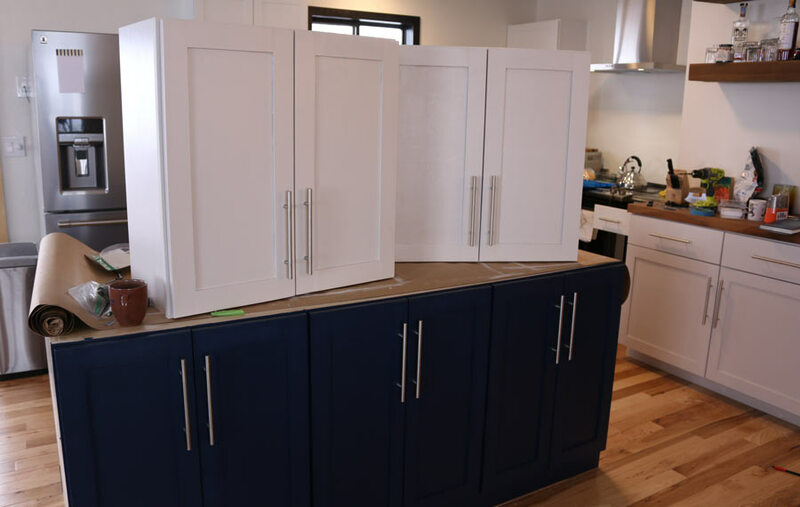 For those of you who would prefer to buy cabinets, you can typically by stock cabinets at the larger hardware stores or special order custom cabinets. Hanging cabinets is quite easy and definitely doable for a DIY'er. I want to thank Maytag once more for sponsoring this project and helping support more FREE projects on DIYPete.com. If you are researching washers and dryers, I would highly recommend taking a look at the Maytag brand, especially during their May is Maytag Month promotion. They work great! Best of luck with your DIY projects and cheers from Montana!